Proteomic analysis of xylem sap has recently become a major field of interest to understand several biological questions related to plant development and responses to environmental clues. The xylem sap appears as a dynamic fluid undergoing changes in its proteome upon abiotic and biotic stresses. Unlike cell compartments which are amenable to purification in sufficient amount prior to proteomic analysis, the xylem sap has to be collected in particular conditions to avoid contamination by intracellular proteins and to obtain enough material. A model plant like Arabidopsis thaliana is not suitable for such an analysis because efficient harvesting of xylem sap is difficult. The analysis of the xylem sap proteome also requires specific procedures to concentrate proteins and to focus on proteins predicted to be secreted. Indeed, xylem sap proteins appear to be synthesized and secreted in the root stele or to originate from dying differentiated xylem cells. 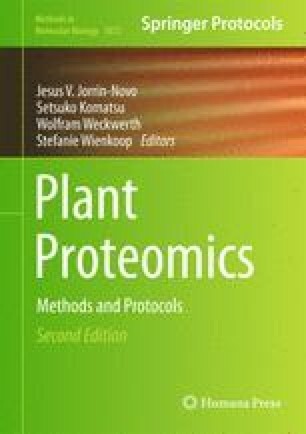 This chapter describes protocols to collect xylem sap from Brassica species and to prepare total and N-glycoprotein extracts for identification of proteins by mass spectrometry analyses and bioinformatics. The authors are grateful to the Université Paul Sabatier-Toulouse 3, France, CNRS, and INRA for support. A grant for the experiments and the postdoctoral position of TDDB were provided by the French Agence Nationale de la Recherche (Grant ANR-08-BLAN-0193-01). The authors wish to thank Drs Benoît Valot and Michel Zivy at the Plateforme d'Analyse Protéomique de Paris Sud-Ouest (PAPPSO) for fruitful collaboration. Thibaut Douché is acknowledged for his contribution to proteomics developments in the lab.